Le Projet OpenNebula a annoncé récemment un plan pour soutenir et promouvoir la création de groupe d’utilisateurs d’OpenNebula locaux dans différents pays. Le but de chaque communauté sera d’organiser régulièrement des réunions et des ateliers où les utilisateurs d’OpenNebula (développeurs, administrateurs, chercheurs et responsables IT) pourront se retrouver pour partager leurs expériences (aspects techniques, best pratices, cas d’utilisation) et développer leur réseau. Pour ne pas rater cet appel qui est une opportunité unique pour développer l’échange entre les utilisateurs OpenNebula en France, j’ai pris l’initiative de travailler à mettre en place cette communauté. Pour rassembler les utilisateurs autour de ce projet, un groupe de discussion Google et une page WIKI ont été mis en place pour faciliter la diffusion des informations. L’accès au groupe est ouverte à tous. Une fois qu’on aura atteint un nombre raisonnable d’inscrits, nous organiserons la première réunion qui marquera le démarrage effectif du groupe. Nous souhaitons à terme organiser des évènements bi-mensuels à travers différentes villes de France. En collaboration avec SysFera, nous nous proposons de mettre à disposition des locaux pour des évènements organisés sur Lyon. Si vous êtes intéressés à assurer le relais dans votre ville, merci de rejoindre le groupe de discussion pour nous en informer. This is the official announcement of OpenNebulaApps 4.0 Beta, a suite of tools for users and administrators of OpenNebula clouds to simplify and optimize multi-tiered application management. This new OpenNebulaApps release is fully integrated with the new OpenNebula 4.0, including tabs for the new Sunstone views. Il progetto OpenNebula ha annunciato di voler supportare e promuovere la creazione di gruppi utenti locali, con lo scopo di organizzare incontri per la condivisione di esperienze e idee, confrontarsi sui vari aspetti tecnici e su come promuovere attivamente l’utilizzo di OpenNebula nel nostro territorio. Non potendo mancare a quest’appello, stiamo cercando di aggregare persone interessate a partecipare alle discussioni sul Gruppo Google dedicato, e con lo scopo di organizzare pizzate e talk a cadenza bimestrale da parte di chi vuol condividere la propria esperienza diretta con OpenNebula. Ad oggi è stata data disponibilità di locali fisici dove ritrovarsi e dove organizzare eventi a Pisa e a Milano (rispettivamente da Liberologico e Webfacilities), e siamo aperti anche ad altre possibili location e sponsorizzazioni per eventi in altre parti d’Italia. Se anche tu vuoi dare il tuo contributo, iscriviti al gruppo e visita la pagina web appositamente dedicata contenente i riferimenti per metterti in contatto con gli altri utenti OpenNebula italiani. The OpenNebula Project pleased to announce the availability of a community developed VM MAD which enables Infiniband interfaces in KVM virtual machines. The driver is compatible with OpenNebula 3.x and 4.0. An SR-IOV enabled environment is a prerequisite for the driver. For more information or to download the KVM-SRIOV VMM visit the drivers webpage. 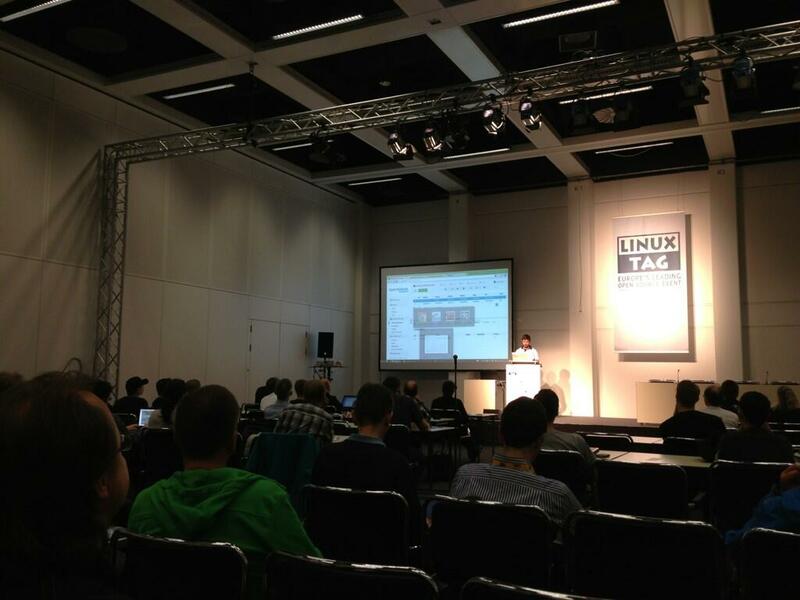 Last Wednesday we participated in the 2013 edition of LinuxTag in Berlin, Germany. It was a great opportunity to chat about OpenNebula, cloud, and free software. We are proud to announce the first, partial list of Keynote Speakers for OpenNebula Conference 2013. The list includes world’s leading corporate and research institutions. Stay tuned because more Keynote Speakers will be announced soon!. There is also available a limited number of speaking opportunities. Please fill in the proposal form to register your interest in presenting at OpenNebula Conference 2013. We are looking forward to welcoming you personally in Berlin!. Please register as soon as possible since the number of places is limited. There is still time to take advantage of our early registration offer, which expires at the end of June. Start Your New OpenNebula User Group! The OpenNebula Project is happy to announce the support for the creation and operation of OpenNebula User Groups. An OpenNebula User Group is a gathering of our users in a local area to share best practices, discuss technical questions, network, and learn from each other. If you are a passionate OpenNebula user and are interested in starting your own OpenNebula User Group, join our Community Discuss mailing list and let us know about your plans. There is more information in the new User Groups section of our site. We look forward to your User Group proposal! https://opennebula.org/wp-content/uploads/2018/11/opennebula_cloud_logo_white_bg-4.png 0 0 Javier Fontan https://opennebula.org/wp-content/uploads/2018/11/opennebula_cloud_logo_white_bg-4.png Javier Fontan2013-05-14 17:31:122013-05-14 17:31:12Start Your New OpenNebula User Group! Having released OpenNebula 4.0 Eagle, now is the time to close the release cycle with a public webinar showing the new features included in the latest stable release. You are all invited to join the webinar this Tuesday 14th at 17:00 CEST, to learn what has kept us so busy in the last months. This will also mark the milestone of the opening cycle for the next release, OpenNebula 4.2. This cycle will start with an IRC meeting this Thursday 16th at 17:00 CEST to discuss the requests for new features and for extending existing features. This valuable input will be used to create the short-term roadmap with the features that will be part of the release cycle. The ideal process of the discussion would be for any person interested in discussing a feature request to open first a feature request ticket in the OpenNebula development portal. Before opening it, though, if you haven’t read how we manage the features request, please do so here. The OpenNebula developers would discuss in the IRC meeting those features requesst in the Pending state. See you at the #opennebula channel at freenode.net! Here’s our monthly newsletter, a bit delayed due to the release effort (sorry folks! ), with the main news from the last month, including what you can expect in the coming months. OpenNebula 4.0 Eagle has been released this month, with the new Sunstone aspect and the new awesome features: Sunstone Views functionality, a whole new set of operations for VMs like system and disk snapshotting, capacity resizing, programmable VM actions, IPv6, new drivers also, like Ceph; as well as improvements for VMware, KVM and Xen. The Sandboxes have been updated to 4.0, so if you want to try out the goodies that Eagle brings under the hood, take a look at the Try Out section. You can download and launch a virtual machine with a configured OpenNebula installation, with various flavors for ESX, VirtualBox, KVM and Amazon EC2. There are new screencasts available, to swiftly glimpse the new functionality offered. Now is the time to plan the roadmap for the next release. For this reason, we will organize a demonstration of the new features of Eagle, followed a couple of days after of an IRC session to discuss with the community the nice things to have for the next release, 4.2. Reached this point, we want to give a huge THANKS! to our community. No, seriously guys, you rock big time. Feedback obtained for the beta and release candidates were precious, detailed and very important. Eagle wouldn’t be nearly as good as it is today without all of you. Patrick McGarry, from the Ceph team, worked with us to create a blog post explaining the new and shiny integration of OpenNebula and Ceph. Giovanni Toraldo also participated extensively integrating jcloud with the OpenNebula EC2 interface (econe), suggesting improvements in the interface to smooth the integration. There has been a grand effort carried out by the community in the matter of the Sunstone translations. Eagle just included three new languages (Dutch, Polish and Simplified Chinese) to OpenNebula Sunstone, making the overall available number of languages the impressive figure of 17. Many thanks to all translators! A big milestone for the OpenNebula project is the First OpenNebula Conference!. The Conference, based in Berlin, will serve as a meeting point for OpenNebula cloud users, developers, administrators, builders, integrators and researchers and a unique opportunity for discussion and collaboration with other projects. Join us in Berlin in September, 24-26! Trinity College Dublin Talk and Irish Free Software Organisation, An Introduction to OpenNebula, Dublin, May 15. Hackathon May 2013, May 16-17, Dublin. OpenNebula 4.0 Eagle is Out! The OpenNebula project is proud to announce the immediate availability of OpenNebula 4.0 Eagle. The project has come a long way since the first “technology preview” of OpenNebula five years ago. During these years we’ve witnessed the rise and hype of the Cloud, the birth and decline of several virtualization technologies, but specially the encouraging and exciting growth of OpenNebula; both as a technology and as an active and engaged community. OpenNebula 4.0 is the result of the terrific feedback of the day-to-day operation of virtualized infrastructures by many of you, result of all your contributions, bug reports, patches, and translations, but one and foremost, OpenNebula 4.0 is the realization of a vision of simplicity, openness, code-correctness and a sysadmin-centric approach. This defines our personality as a community, it defines the OpenNebula Way. Now the features that you’ve been waiting for…. OpenNebula 4.0 includes new features in most of its subsystems. We are showing for the first time a completely redesigned Sunstone, with a fresh and modern look and an updated workflow for most of the dialogs. The also new Sunstone Views functionality allows to customize the GUI for each type of user or group, so the interface implements a different provisioning model for each role. A whole new set of operations for VMs like system and disk snapshoting, capacity re-sizing, programmable VM actions and IPv6 among others. There are some new drivers also, like Ceph; as well as improvements for VMware, KVM and Xen. The scheduler has received some attention from the OpenNebula team to easily define more placement policies… and much more (see below). This is a stable release and so a recommended update that incorporates several bug fixes since 4.0 Beta and 4.0 RC. Although this is a major release we’ve done our best to keep compatibility with OpenNebula 3.8 so any application developed for previous versions should work without effort. We have changed the name of some of the operations over the VM (we have now 32 different management actions) so be sure to check the compatibility and upgrade guides. As enterprise-ready product, each OpenNebula Series is maintained for three years, in few days we will release the first Service Pack for the OpenNebula 3 Series. As usual OpenNebula releases are named after a Nebula. The Eagle Nebula (catalogued as Messier 16 or M16, and as NGC 6611, and also known as the Star Queen Nebula) is a young open cluster of stars in the constellation Serpens, discovered by Jean-Philippe de Cheseaux in 1745-46. It is located about 7,000 light-years away from Earth. Thanks to all people that have contributed to OpenNebula 4.0! We have created a series of screencasts to illustrate the most improtant features of OpenNebula 4.0.
https://opennebula.org/wp-content/uploads/2018/11/opennebula_cloud_logo_white_bg-4.png 0 0 Ruben S. Montero https://opennebula.org/wp-content/uploads/2018/11/opennebula_cloud_logo_white_bg-4.png Ruben S. Montero2013-05-08 15:51:442013-05-08 16:26:50OpenNebula 4.0 Eagle is Out!